According to youth.gov, October 14-20 is National Teen Driver Safety Week, a week dedicated to raising awareness of the serious risks today's teens confront on the roads. 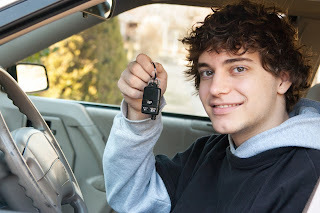 The Federal Highway Administration reports that there were nearly 10 million licensed drivers aged 19 and younger in the U.S. as of July 2016. And, according to AAA, teen drivers are 9 times as likely as drivers 18 and older to be involved in a crash and 6 times as likely to be involved in a fatal crash. Statistics like this are sobering for any parent, any teen and anyone who shares the road with these young drivers. Understanding the risks and finding ways to help neutralize them are good first steps in striving for a safer, better driving experience for everyone. The top threat to teens’ driving safety may surprise you. It's not their smartphones. According to the CDC, the No. 1 threat is driving or riding in a car with another teen driver. And, the main cause of fatal teen auto crashes is driver inexperience. And, as we all heed warnings about distracted driving, a 2017 study by Liberty Mutual shows that getting older may not help younger drivers. It reports older teen drivers are more likely to use a phone while driving than younger teens: In fact, 67 percent of high school seniors, 58 percent of juniors and 49 percent of sophomores admit to using apps while driving. While other dangerous behaviors include having 3 or more passengers, speeding and driving when drowsy. The National Highway Transportation Safety Administration offers resources to help people of all ages avoid distracted driving. It reminds us that teens, parents, educators and employers can all take action to help enhance safety for teen drivers. Some of the solutions make a lot of sense. Graduated Driver Licensing systems can reduce crashes involving teen drivers by as much as 40 percent, according to the National Safety Council. If you have an iPhone, you know the latest iOS update includes a Do Not Disturb While Driving feature that can disable notifications, calls and texts while you're driving. And, there are several smartphone apps and other tech tools that can help support safe driving for anyone of any age. For parents with teens, the CDC suggests having regular conversations about safety, practicing driving together, and leading by example. It can go a long way in ensuring your teen makes smart decisions when they get behind the wheel. No matter how old you are, we remind you that your safety always comes first -- whether you're seventeen or seventy -- especially when you're driving. For more information supporting National Teen Driver Safety Week, see the tools, links and resources available through youth.gov here, or search #TeenDriver this week through your social media channels.